Buying the right shade sail is the first step- then there’s the issue of having it properly installed. No time for a DIY job? No problem. We install your new shade sail for you quickly and efficiently, making sure your backyard, pool, deck or driveway is covered with the most reliable sun and rain protection possible. Fast and professional domestic installation service is available in all suburbs across Melbourne, helping to keep Victorian families protected from sun damage. With our expert construction your shade sail is sure to be stable and properly set up, providing maximum safety and protection. Square and triangle shade sails are beneficial for any outdoors residential domestic area that needs protection from sun, wind and rain. Offering up to 98% protection no matter what time of day it is or how extreme the heat, UV inhibitors prevent any harmful rays from penetrating the fabric, providing optimum protection against sun damage to the skin, such as sunburn and skin cancer. Breathable fabrics allow cool air to circulate beneath the shelter of your shade sail, providing you with a comfortable, airy and well ventilated space. Shade sails also provide limited shelter from rainy weather to let you enjoy a dry outdoor space even in a light drizzle. To allow airflow shade sails are however never completely water proof and should not be relied upon to protect items that are sensitive to water. We’ll get the job done efficiently so you can spend less time waiting around and more time enjoying the benefits of your new shade sail. All our installation staff members are highly knowledgeable about shade sails and are dedicated to providing the safest and most stable construction. Why pay more? Not only are our installation fees lower than competing suppliers, but we throw in a free consultation, measure and quote on all jobs. 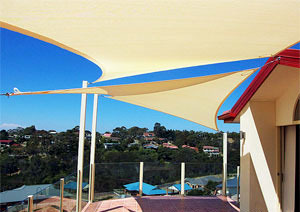 For the best installation service in Australia choose Melbourne Shade Sails™ and enjoy the benefits. To get a FREE on-site measure and quote for your project follow the link below, or simply give us a call and speak to one of our consultants on 1300 99 32 37.